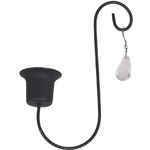 The Old French Candle Holder by Chic Antique with crystal in Antique Coal we find adorable. 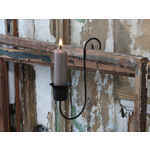 It is easy to attach and when equipped with a short candle it becomes a charming light source in the room. Whether in the living room, dining room or in the kitchen, the Old French candlestick will delight us everywhere with beautiful candlelight. The small, fine crystal at the end of the candle holder offers a nice contrast to the metal holder. The Chic Antique candlestick with crystal is also a nice gift idea for a dear friend.